If the Runner suffers net damage and one of the cards trashed is I've Had Worse, which goes first: trashing the top card of the stack or drawing three cards? Both Potential Unleashed and I’ve Had Worse meet their trigger conditions at the same time. If it is currently the Runner’s turn, they draw three cards then trash a card from the top of the stack. If it is the Corp’s turn, the top card of the stack is trashed then the Runner draws three cards. If the Runner takes more than 1 net damage at once (e.g. with Project Junebug), how many cards do they trash from the top of the stack? “For each” effects are a single batch of net damage that depends on another value, so only one card from the top of the stack is trashed. They all seam to do something similar but in fact it’s very different, let’s break it down. Jinteki: Potential Unleashed lets you grind out your opponent more quickly if you play a death by a thousand cuts style of deck. The important thing to note is you won't be winning of this ability however you will get your opponent quicker to deplete his deck and look at a very big heap instead. As an added benefit you get to disrupt his deck by random trashing - very nasty indeed. Lastly 3 influences less than the peers, not game breaking but uncomfortable. Chronos Protocol: Selective Mind-mapping is the quality option, this triggers only once per turn maximum and basically allows you to replace the random net damage trash with a card of your choosing. Given that people want to keep good cards in hand you can disrupt their game plan (also vs Jinteki people just want to have a full hand). Lastly you know what they are up to since you get to look - nice to see whats coming your way. Jinteki: Personal Evolution now seams to be the weakest of them all - wrong. The ID's ability might have the fewest chances to trigger per game BUT it lets you win games. It makes multi access much more threatening as they may access more agendas than they hoped for. Advanced cards on the bored can turn into out of the red net damage and a scored agenda for the Corp. This ID hands down is still the most dangerous of all of them - especially in early game when there are lots of agendas to score. However this ID is probably the hardest to master of them all. In summery Potential Unleashed lets you grind down their deck, Selective Mind-mapping gives you the most control on their game plan and Personal Evolution makes them what you relay want as a Jinteki player - question every move they make, fear every face down card and break a sweet when they access a card. Coming from a huge fan of Jinteki I find no joy in admitting that after an objectionable reflection of Potential Unleashed, I'm still on the fence as to whether this ID is worth playing over Pālanā Foods: Sustainable Growth; let's break it down and study it a little. So this ID sacrifices utility and versatility to maximise milling threat. The ability triggers on each instance of Net damage, forcing the Runner to discard the top card of their Stack. When Runners took a gamble at running a protected Jinteki server they would weigh up their grip and contemplate how damaging it would be if they lost this particular hand of cards; now, net damage preys on the unknown and makes the Runner think if they're going to lose their only Decoder / Plascrete / etc. from their stack. This is quite a huge threat for anyone not running recursion, especially Criminal. Ark Lockdown servers as an opportunity to destroy Levy AR Lab Access before it can be played, potentially locking the Runner out of specific servers for the rest of the game. Having this kind of threat comes with the cost of highly porous in-faction ICE with a clipped influence to boot; forcing your playstyles to be 'lockout' or 'flatline'. 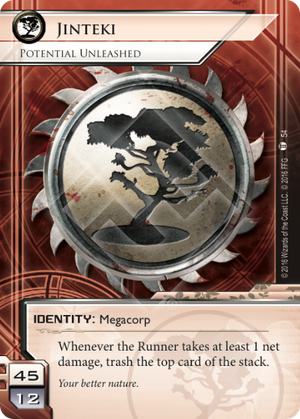 It's somewhat refreshing to have Jinteki return to its murderous roots, more-so with Rumor Mill shutting down nearly all of Jinteki's reliable means to score; but good Runners will balance their runs and known when and how to take calculated risks. With much of the ICE needed to compliment Potential Unleashed in faction and expected in these deck, winning is likely to be a test of attrition; PU wants to find your breakers and your Levy through its tried and tested 1000 cuts. With Aiki and DNA Tracker added to the roster, net damage is looking more attractive, but cost affects play more than often and Jinteki are by no means thriving with Econ. Balancing the right ICE, with the right number of punishing assets and operations to give validity to your PU deck does cut short a number of your win options, and you may have to rely on the shell game to attempt to score when desperate. It's very much an Identity that relies on luck, but having your opponent sweat in fear of making a terrible mistake can make it all worth while. Ironically I don't think it has unleashed its full potential just yet, and I look forward to seeing what experiments give this Blade Tree some sharper, more competitive teeth.